A glomerulus (RP English pronunciation: /ɡlɒˈmɛr(j)uːləs/, American /ɡlɒˈmɛrələs/) is a network (as a tuft) of capillaries located at the beginning of a nephron in the kidney. It serves as the first stage in the filtering process of the blood carried out by the nephron in its formation of urine. The glomerulus is surrounded by a cup-like sac known as Bowman's capsule. The blood plasma is filtered through the capillaries of the glomerulus into the capsule. The Bowman's capsule empties the filtrate into the proximal tubule that is also part of the duct system of the nephron. A glomerulus receives its blood supply from an afferent arteriole of the renal circulation. Unlike most other capillary beds, the glomerulus drains into an efferent arteriole rather than a venule. The resistance of these arterioles results in high pressure within the glomerulus, aiding the process of ultrafiltration, where fluids and soluble materials in the blood are forced out of the capillaries and into Bowman's capsule. The glomerulus is a tuft of small blood vessels called capillaries located within Bowman's capsule within the kidney. Between the capillaries and Bowman's capsule lies the mesangium. Blood enters the capillaries of the glomerulus by a single arteriole called an afferent arteriole and leaves by an efferent arteriole. The capillaries are lined by a layer of cells (an endothelium) that has a unique structure, allowing blood components to be filtered, and resulting ultimately in the formation of urine. The juxtaglomerular apparatus allows specialized cells to monitor the composition of the fluid in the distal convoluted tubule and adjust the glomerular filtration rate. (b) This micrograph shows the glomerulus and surrounding structures. A glomerulus receives blood from a single artery called the "afferent artery". The afferent artery is a branch of an interlobular artery in the cortex of the kidney. Contraction or relaxation of the artery can affect the pressure of capillaries in the glomerulus, and consequently the filtration of blood. Sympathetic nervous system action as well as hormones can also impact glomerular filtration rate by modulating afferent arteriole diameter. As an example, one study involving rats found that having narrowed afferent arterioles contributed to the development of increased blood pressure. The juxtaglomerular apparatus allows specialized cells to monitor the composition of the fluid in the distal convoluted tubule and adjust the glomerular filtration rate. Capillaries of the glomerulus are lined by endothelial cells. These contain numerous pores (called fenestrae) 50–100 nm in diameter. Unlike those of other capillaries with fenestrations, these are not spanned by diaphragms. These pores allow for the free filtration of fluid, plasma solutes and protein. However they are not large enough that red blood cells can be filtered. The glomerulus has a basement membrane consisting mainly of laminins, type IV collagen, agrin and nidogen, which are synthesized and secreted by both endothelial cells and podocytes. These form a membrane 250–400 nm in thickness, which is thicker than basement membranes in other types of tissue. The effects of mutations in the constituents of the glomerular basement membrane suggest that it plays a role in the permeability and selectivity of the filtration barrier to large molecules, such as albumin. The side of the basement membrane that faces outwards from the capillary is lined with folds called podocytes. These are themselves lined with folds of cytoplasm called foot processes, or pedicles. These control the filtration of proteins from the capillary lumen into Bowman's space. The space between adjacent podocyte foot processes is spanned by a slit diaphragm formed by several proteins including podocin and nephrin. 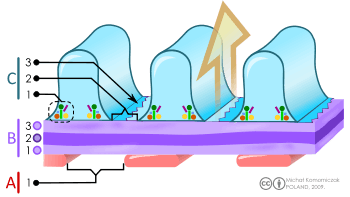 In addition, foot processes have a negatively charged coat (glycocalyx) that limits the filtration of negatively charged molecules, such as serum albumin. The space between the cells of a glomerulus is occupied by intraglomerular mesangial cells. They are not part of the filtration barrier but are specialized pericytes that participate indirectly in filtration by contracting and reducing the glomerular surface area, and therefore filtration rate, in response mainly to stretch. Blood is carried out of the glomerulus by an efferent arteriole instead of a venule, as is observed in most other capillary systems. This provides tighter control over the blood flow through the glomerulus, since arterioles dilate and constrict more readily than venules, owing to arterioles' larger smooth muscle layer (tunica media). Efferent arterioles of juxtamedullary nephrons, the 15% of nephrons closest to the medulla, send straight capillary branches that deliver isotonic blood to the renal medulla. Along with the loop of Henle, these vasa recta play a crucial role in the establishment of the nephron's countercurrent exchange system. The filtrate that has passed through the capillaries of the glomerulus enters Bowman's capsule. From there, it leaves the corpuscule by a proximal convoluted tubule and enters the collecting duct system of the nephron. The glomerulus is the network (tuft) of capillaries in red. Blood flows in via the afferent arteriole and out via the efferent arteriole (arrows). The round, double-walled structure in white is Bowman's capsule. The liquid component of blood (plasma)is filtered by passing through the glomerular membrane, which consists of the capillary wall and the epithelial layer of Bowman's capsule. The filtered blood leaves through the tubule at the top. 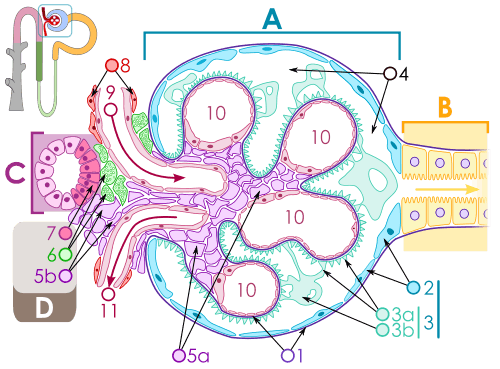 The main function of the glomerulus is to filter plasma to produce glomerular filtrate, which passes down the length of the nephron tubule to form urine. The rate at which the glomerulus produces filtrate from plasma (the glomerular filtration rate) is much higher than in systemic capillaries because of the particular anatomical characteristics of the glomerulus. Unlike systemic capillaries, which receive blood from high-resistance arterioles and drain to low-resistance venules, glomerular capillaries are connected in both ends to high-resistance arterioles: the afferent arteriole, and the efferent arteriole. This arrangement of two arterioles in series determines the high hydrostatic pressure on glomerular capillaries, which is one of the forces that favour filtration to the Bowman's capsule. If a substance has passed through the glomerular capillary endothelial cells, glomerular basement membrane, and podocytes, then it enters the lumen of the tubule and is known as glomerular filtrate. Otherwise, it exits the glomerulus through the efferent arteriole and continues circulation as discussed below and as shown on the picture. The structures of the layers determine their permeability-selectivity (permselectivity). The factors that influence permselectivity are the negative charge of the basement membrane and the podocytic epithelium, and the effective pore size of the glomerular wall (8 nm). As a result, large and/or negatively charged molecules will pass through far less frequently than small and/or positively charged ones. For instance, small ions such as sodium and potassium pass freely, while larger proteins, such as hemoglobin and albumin have practically no permeability at all. The oncotic pressure on glomerular capillaries is one of the forces that resist filtration. Because large and negatively charged proteins have a low permeability, they cannot filtrate easily to the Bowman's capsule. Therefore, the concentration of these proteins tends to increase as the glomerular capillaries filtrate plasma, increasing the oncotic pressure along the length of a glomerular capillary. GFR is the glomerular filtration rate. Histological specimen of a glomerulus affected by a thrombus. The glomerulus plays a significant role in facilitating kidney function. Damage to the glomerulus will alter what is filtered through the kidney filtration barrier. Conditions such as glomerulonephrosis and glomerulonephritis will alter the solutes filtered by the kidney, for example allowing red blood cells and proteins to be secreted. This can cause systemic problems. In 1666, Italian biologist and anatomist Marcello Malpighi first described the glomeruli and demonstrated their continuity with the renal vasculature (281,282). About 175 years later, surgeon and anatomist William Bowman elucidated in detail the capillary architecture of the glomerulus and the continuity between its surrounding capsule and the proximal tubule. 1 2 3 4 WHEATER 2006, p. 304. 1 2 WHEATER 2006, p. 307. 1 2 3 WHEATER 2006, p. 310. ↑ Suh, JH; Miner, JH (2013). "The glomerular basement membrane as a barrier to albumin". Nature reviews. Nephrology. 9 (8): 470–477. doi:10.1038/nrneph.2013.109. PMC 3839671 . PMID 23774818. 1 2 3 Boron, WF. ; Boulapep, EL. (2012). Medical Physiology (2nd ed.). Philadelphia: Saunders. pp. 771, 774. ISBN 978-1437717532. ↑ Guyton, Arthur C.; Hall, John E. (2006). Textbook of Medical Physiology. Philadelphia: Elsevier Saunders. pp. 316–317. ISBN 0-7216-0240-1. 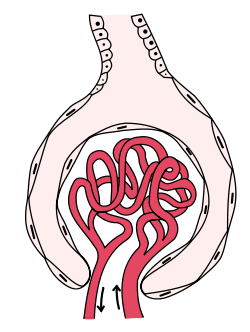 Wikimedia Commons has media related to Glomerulus. Hall, Arthur C. Guyton, John E. (2005). Textbook of medical physiology (11th ed.). Philadelphia: W.B. Saunders. p. Chapter 26. ISBN 978-0-7216-0240-0. Deakin, Barbara Young ...  ; drawings by Philip J.; et al. (2006). Wheater's functional histology : a text and colour atlas (5th ed.). [Edinburgh? ]: Churchill Livingstone/Elsevier. p. Chapter 16. ISBN 978-0-443068508.